This full sized model is made of a synthetic material that closely resembles the touch and feel of real flesh. 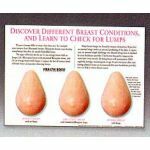 Contains palpable and non-palpable lumps that simulate easy and hard to find breast tumors. Includes a slip on cover and carrying case. Suitable for female health, OB-GYN, training for breast self exams, surgical dissection, or for patient education/demonstration of procedures.